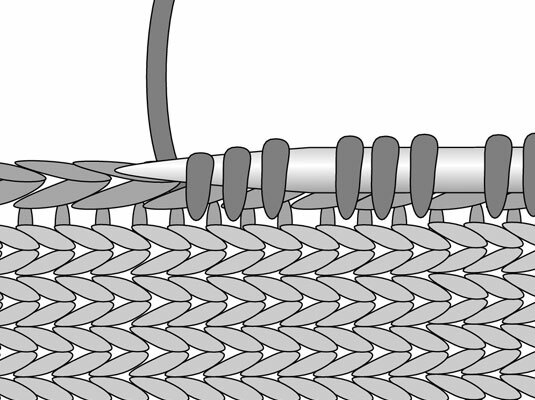 Picking up stitches is a knitter’s way to avoid sewing on extra edgings. When you pick up stitches along a vertical edge, such as a cardigan front, remember that there are more vertical rows of stitches per inch than there are stitches across. You must match stitches to rows. With the RS facing, starting at the right end of the work, insert your needle between the running threads of the first 2 stitches from front to back. Wrap the yarn as if to knit, and pull the new loop through. Repeat these steps, pulling stitches up through the column of running threads until you’ve picked up the number of stitches you need for your finished edge.